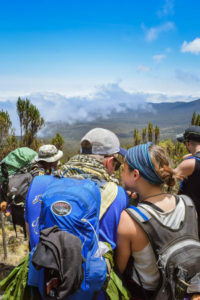 If you’re reading this, I’m assuming that you’re planning to climb Kilimanjaro and you’re figuring out what to pack. When we went, I put together this little guide for our team so they’d know what to bring — and now I’m passing it along to you! If you can use it and benefit from it, great! The general idea our packing list was 1. 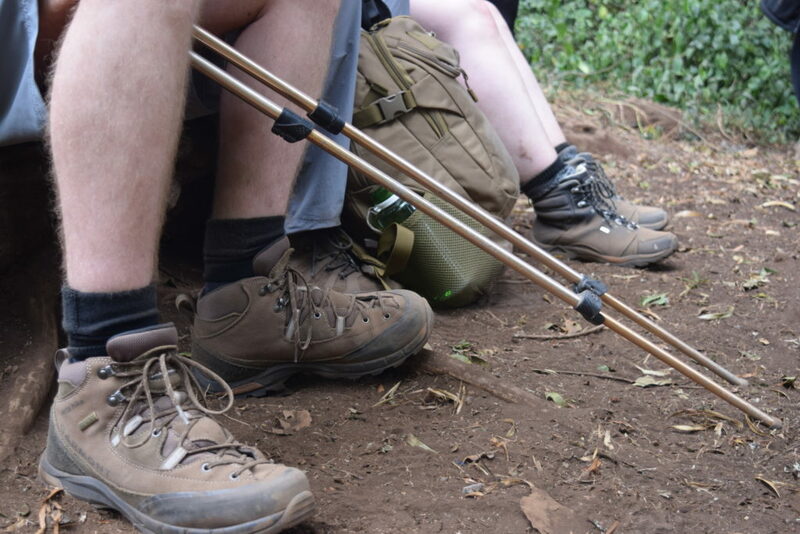 “you’re going to get dirty, so just plan to be dirty” and 2. we were starting our trip with the Kili climb and then hiking around Tanzania for the next 2-3 weeks, so we didn’t want to bring a million pounds of cold-weather gear that we’d have to drag around Africa afterwards. With our objectives in mind, you might want to modify our packing list to better suit your objectives/needs. If you have a lot of porters, or if you’re flying straight in and back out, maybe you want to pack more than we did and be more comfortable. If you read nothing else, read this: Absolutely, Positively, No Cotton!! The temperature varies from hot at the base to freezing at the summit, so layering effectively will be critical to packing lighter. The efficiency of your layering is directly correlated to the efficiency by which the clothing material wicks away water. Some materials wick water more effectively than others. Wool and merino wool wick sweat/water very effectively – and, simultaneously, are antimicrobial. The “bad smell” of worn clothes is usually a result of bacteria. Wool and merino wool don’t “smell bad” after repeat wearing because the bacteria doesn’t grow in them. Thereafter, you can wear them more frequently with fewer washings (compared to, for instance, cotton) without odors. Wool is itchy, but merino wool is a very fine wool that doesn’t itch. The downside is that merino wool tends to be very expensive ($50-75 for a single t-shirt). A single merino wool t-shirt effectively replaces ~3 cotton t-shirts in your pack, though. For tops, merino wool is usually given in “weight” or “thread count.” 150 is lightweight, 200-250 is middleweight, and everything above 250 is heavy. Lighter stuff is better for warmer weather, but is more fragile; heavier stuff is better for colder weather and is more durable. Nylon is very lightweight, wicks water, and is antimicrobial as well. You can wear nylon pants/shorts for a very long time without washing, and they’re very lightweight for packing. They don’t trap heat the way cotton does, so they’re very cool, which makes them great for hot weather but horrible for cold weather. Most commonly, I’ve found nylon is used for technical pants/shorts. It’s not an expensive material, so depending on the company, you can find options for really reasonable prices. I just picked up a pair of nylon shorts at REI on sale for $25 and another pair at TJ Max for $12. Polyester is another lightweight water-wicking fabric. Also, polyester does not wrinkle the way cotton does – which is why it’s found in so many technical “travel clothing” products. Polyester, however, is not antimicrobial and will (maybe notoriously) start to smell. “Pure” polyester is most commonly found in button-up shirts, I’ve found; and “blends” of polyester (with, for instance, cotton) can be found in just about everything. The “blends” are only for anti-wrinkle and don’t really add to the wicking – with the exception being Poly/Nylon blends. On occasion, there’s a material with some exotic brand-name, but it usually ends up being one of the aforementioned materials or a blend thereof (sometimes including cotton). Water-wicking is not only important because you’ll be sweating in this stuff; but because, if it rains or you sweat a lot, you’ll want your gear to dry out overnight. Cotton won’t dry overnight, and you’ll end up with a bunch of soaked, unusable gear. Ideally, you want antimicrobial fabrics because you want to carry fewer items, so you will want to rotate-and-reuse clothing without washing. 3-6 pairs of sport (merino wool, or nylon) underwear – Icebreaker, Smartwool, ExOfficio are three top-end companies. If you are based in the UK, we would recommend the all-natural antimicrobial underwear from SueMeLondon. 1 Bottom/Leggings Thermal Base Layer – Icebreaker, Smartwool, Nike, etc. 4-6 Short-Sleeve Shirts – not cotton. 1 Long-Sleeve Shirt – Any (for instance) poly-blend long-sleeve shirt would work here, as they’re very popular (and cheap). The long-sleeve Nike running shirts (dri-fit) are usually polyester and work great here. Could also be Icebreaker or Smartwool long sleeve shirts. 1-2 Hiking Pants – I use Prana Zion pants and I can’t recommend them enough. They’re stretchy, comfortable, and most importantly — they’re nylon! They dry fast and they don’t hold on to smelly bacteria. You can also check out Columbia, Mountain Hardware, etc. I snapped this picture of Cici. Flip-flops/sandals, shiny rain pants, fleece, and a neck tube/headscarf. Well, it works. 1 Mid-Layer – Fleece such as the Columbia Fleece Jacket or down. I personally wear the Marmot down Puffer jacket and it served as a great mid-layer on Kili. 1 Insulating Water/Wind Shell – This is a heavy jacket, which most people tend to already own (which is why I’m including this option). 1 Light Wind Layer – I use one by Salomon; but Marmot makes a lightweight Dri-climb hoodie, and the North Face makes the Cyclone, among many others. Just look at reviews and sales. For this outerwear-option path, you want a breathable wind layer and not something waterproof. 1 Insulating Mid-Layer – Light down-jacket or fleece layer. In addition to the Marmot I mentioned earlier, I also use a Mountain Hardware Ghost Whisperer. It’s only a few ounces, but they’re pretty expensive. Any small, technical down-puffy/fleece would work here, though. You’ll be carrying this with you for any time you get chilly on the trail or at camp, so down is a great option to keep weight low; but fleece doesn’t lose its ability to insulate when wet. 1 Insulating outer-layer – Fleece or heavy down, specifically for summit day. If you used down for the insulating mid-layer, aim for a down outer layer; and vise versa. 1 Rain layer/shell – There are a lot of super-light options. The Outdoor Research Helium II Jacket is really popular and you can pick it up for ~$120 or less on sales. You pay for the “lightweight” aspect, usually, so for more reasonably priced jackets (that are also heavier), check out the Marmot PreCip (~$65). 1 Poncho (optional, for either system) – This would be large enough to cover both you and your pack. 1 pair Boots – Medium to high tops for ankle support; deep lugs on the sole for traction; and medium weight. Several guide companies recommend waterproof boots if at all possible. I went with a non-waterproof pair from REI while Cecilia used her non-waterproof Merrell Hiking Boots, since we already had them. Thankfully it didn’t rain. Proper hiking boots are a must. 1 pair Flippy-floppies (optional) – These are nice to wear at camp and to give your feet a break from being in boots all day. We both wear the Sanuk brand due to their comfort and durability. Plus they are made from recycled yoga mats, so being eco-friendly is always a plus. 1 pair lightweight trekking shoes (optional) – I’ve seen these on a lot of lists. People are mentioning sneakers for walking around camp or exploring around. If you feel that you’ll want these in lieu of your boots for exploring around camp, I’m including these on the packing list. I use Nike Free Flyknit 4.0 as my travel-sneaker because they’re very lightweight and they pack down flat. Some of the campsites are going to be cold and you won’t want to walk around in flip-flops; and otherwise, you probably won’t want to put on your dirty hiking boots after you’ve just cleaned up at camp. 1 pair insoles (optional) – I use insoles with stronger heel shock-absorbers. I take out the insoles on my boots and my Nike sneakers, and I use one pair of insoles that I interchange between both my Nikes and my hiking boots. 4-8 pair trekking socks – Get wool or merino wool hiking socks. 4 socks would be plenty for the hike, but you can pack extras in case of moisture from rain or to change frequently if your feet perspire a lot. You’ll want dry feet to avoid blisters. We loved our Bridgedale hiking socks. They maintained their comfort and integrity throughout several days on the trip. (Check out our full review of the Bridgedale Trekker socks here.) If you like options, you can also check out Smartwool Mountaineering Extra Heavy Crew and Point6 Hiking Essential Crew. Always look for flat seams and thick socks. 1 pair long, wool, thermal trekking socks – These are specifically for the day of the summit, or for sleeping on cold nights. You want thick, heavy socks. 2-4 pair sock liners – These help wick away moisture from your foot; and keep away blisters. Most of these tend to be polypropylene, but check out Bridgedale Ultralight Coolmax Liner socks (~$15 for a 2-pack). Thermal Beanie – The nights get cold, so you’ll probably sleep in it; and a beanie is great on cold mornings, or on summit day. Headlamp – Much better than flashlights. You’re going to want to have your hands free to do things. UV Sunglasses – It gets sunny. Your eyes are going to get pretty tired without some protection. Safari/Sun Hat (optional) – You might feel silly, but a big brim is a life-saver when the hot sun is beating down on you all day, every day. 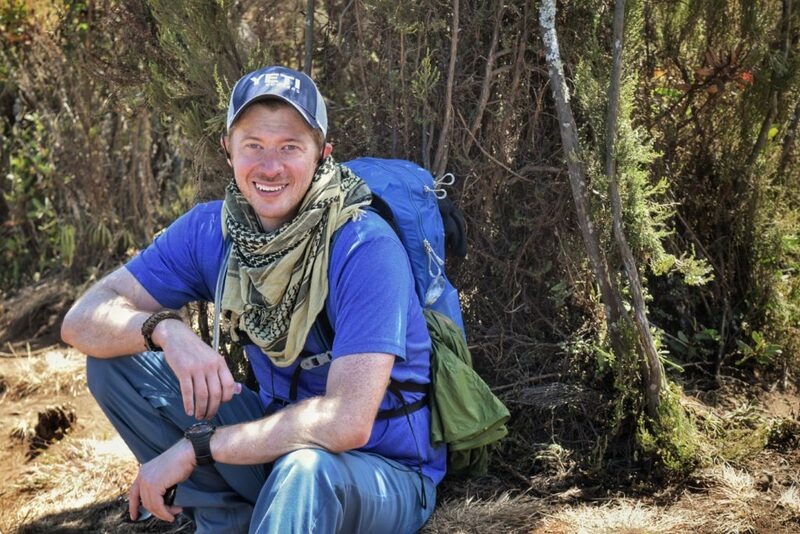 Bandana or Shemagh (optional) – This is to protect your neck from sunburn while hiking; to cover your mouth/nose from blowing dust (and there will be tons of dust); and to cover your face at the summit. We can’t recommend this enough! The added bonus to the Shemagh is that Tanzania is a Muslim country; and in some of the more rural areas, it’s polite for women to cover their hair per local customs. The shemagh will fill that role in case you plan to travel. Balaclava or Airhole Tube Mask– the Kilimanjaro summit (Uhuru Peak) is going to be cold, you will want to cover up as much as possible. We tried the Airhole Airmasks. The small hole allows for easier breathing and helps to prevent wet condensation from your breath forming. Not only did it help with summit night, but it also served as a general face mask during previous days to help block out dust. We highly recommend this product as well as their Airtube version. Aside from blocking out dust and providing extra warmth at night, pour some water on the shemagh and drape it over your neck to keep you cool during hot days. Duffel – The porters will carry your duffel. I used a Farpoint 40L, and the straps zip up to make a duffel. Osprey makes some great day packs. Daypack – Depending on what you want to carry, between 15-25L. Mostly this will be used to hold the clothes that you strip-off during your long hikes, since the mornings will often start out cold and then warm up considerably as the day progresses. Also, you’ll pack your rain gear, snacks, and water. We recommend the Osprey daypack. Small bag locks – These are always recommended by the trekking/guide companies but I never used them. I try not to travel with anything that can’t be lost or stolen. Ziplock bags – These are cheaper than “travel organizers” and are waterproof. They’re great for separating dry from wet gear, or dirty clothes from clean clothes, too. There is going to be dust everywhere, so pack your clean gear in individual ziplock bags so that you can keep your clean clothes clean; then repack the dirty clothes into the old ziplock bag when you’re done with it. You’re going to be tired at the end of a long day of hiking, so have a super-simple system. Don’t go complicated; don’t plan to rearrange all your stuff a thousand times, or to pack each “whole outfit” in one bag. Pack everything in its own individual bag. Rainfly – You’ll want to give your gear every opportunity to stay dry. Have a rainfly for your duffel; and something for your daypack (like the poncho, a black trash bag, or a rainfly). Sleeping bag – Most of the time these can be rented from the trekking companies. Because we knew that we would be traveling through Tanzania post-hike, we chose to rent so that we would not have to lug it around during the rest of our trip. Sleeping Pad – Some trekking companies provide these. Pillow (optional) – We slept on our packs; or on zip-locked piles of dirty laundry. My theory on hiking is: if you sleep too comfortable, then you’ll have a hard time waking up early in the morning. Be the first one out of your tent! No one likes waiting for that last person who’s still packing up. 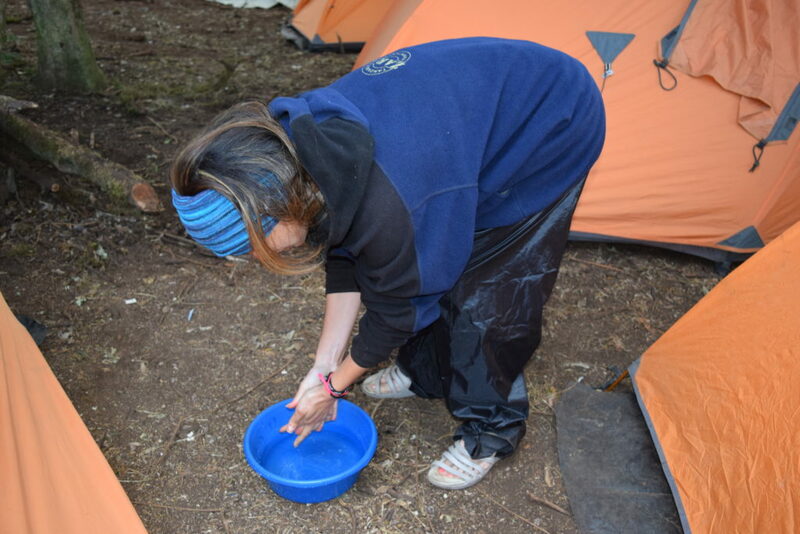 Water bladder – Our porters boiled water for us every morning and night to fill our water bladders, so we didn’t need to carry any iodine or water purification systems. Collapsible water bottle – You’re not going to want to carry your water bladder around camp with you or when you eat dinner. And getting water out of a water bladder is a pain in the wazoo when you’re inside your tent or brushing your teeth. Pack a small, collapsible water bottle like the Vapur Eclipse, and it’ll fill all those roles. Baby wipes – Baby wipes, baby wipes, and more baby wipes. Baby wipe showers are your best friend. We went through 1 large pack of baby wipes per person, and we could have probably gone through more. It wasn’t so much the desire to “be clean” as it was keeping our feet in good condition (foot washing every night) and cleaning our face (because we were covered in dust and didn’t want to keep inhaling it while we slept). Bring baby wipes. Passport – There are usually lock boxes at a lot of the trekking bases; but I don’t like my passport leaving my side, so it comes with me in my daypack. Money – Tip your porters! Tip your porters, tip your porters, tip your porters! Plan to give a tip of +$150. You can also leave your extra gear behind and give it to the porters. Camera – Depending on your style, your cell phone camera might be all you want. Spare batteries – For your headlamp or camera. 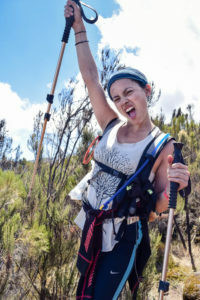 Couldn’t imagine climbing Kilimanjaro without hiking poles. Fleece Gloves AND light glove liners – I wore light glove liners most every day. The sun can be grueling if you’re not exceptionally resistant. The best protection is to hide from it. The fleece gloves you’ll use on the summit — and you’ll definitely need them or you’ll risk losing some fingers. It goes from 100 degrees to 0 degrees in just a day or two. It’s a little surreal. Earplugs (optional) – If you’re a light sleeper, you might want some earplugs. You’ll share campsites with a lot of other hikers going on a lot of different routes. At one site at least, someone was up for what felt like hours listening to a radio. Dysentery pills – I had to use these in Tanzania. Long story. Well, maybe not that long — I pooped myself and needed pills. Okay, story was shorter than I thought.